Peanuts are a great source of protein. They are good body builders. It helps in development of new cells. They are also rich in Fat. Peanuts high niacin content helps in recovery of cell damage provides protection against Alzheimer’s disease and age related cognitive problems. Peanuts are rich in calcium which helps promotes healthy bones. 1) Dry Roast peanuts in a pan.Let them cool. 2) Remove the skin of peanuts by rubbing them in arms. 3) Make sure that the blender is completely dry. 4) Being we are going to prepare powder … if any wetness is there lumps will form and the powder sticks to the blender . 5) Add these peanuts, cumin seeds, garlic cloves, red chilly powder and salt to a blender.Blend it to a coarse powder. 6) Store it in a dry and air tight container. 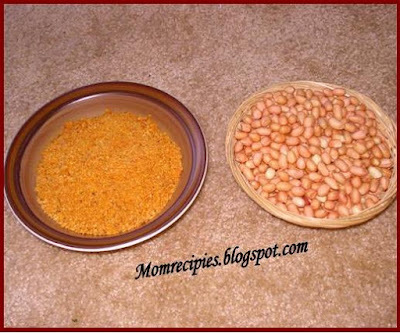 7) This Podi /Powder remains fresh for 3-4 weeks if stored in dry air tight container. 8) Serve in a little heap as an accompaniment to any home-style meal such as dal and rice, yogurt rice or chapati and vegetables. This is the way it is traditionally served. 9) Serve it with hot bowl of rice and ghee or with chapati or paratha or upma. 10) Stir into yogurt for an instant dip. 11) Add some yogurt to the chutney and enjoy with poli/chapati/Paratha. 12) Eat with vada pav . 13) Mix with untoasted sesame oil to make a chutney for idlis and dosas. Tastes Great and Yummy!! !Enjoy it!!!! Kindly accept an award from my blog.Have a nice day. I too love peanuts in anything as anything..peanut powder looks yum! Oooh, that peanut powder is very intriguing. Everything looks good! 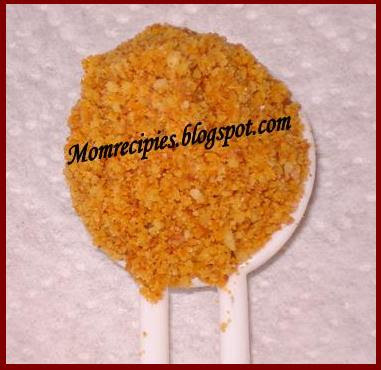 Surely this is one nutritious and delicious podi. Sounds like a healthy and yum podi!